Who doesn't love the holidays? Twinkling lights, merry carolers, the smell of chestnuts roasting on an open fire and the alien creature battling your friendly neighborhood Spider-Man? Welcome to the exciting world of Marvel's Super Hero Adventures! 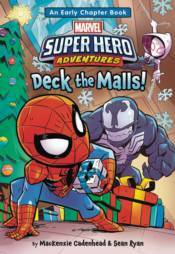 In Deck the Malls, the first book in the series, join Spider-Man and his amazing arachnid ally Spider-Gwen as they take on the alien menace known as Venom. Will Spider-Man outrun Venom before the creature can steal his powers? Will Spider-Gwen figure out Venom's weakness before it's too late? Will the spider-friends save the day in time to finish their holiday shopping? It's anything but a silent night this festive season.